The Association of Lotto Marketing Companies (ALMC) has petitioned government to assist its members acquire solar-powered electronic kiosks being introduced by the National Lottery Authority. The solar-powered e-kiosk project is being piloted by the NLA with support from the private sector. The National Lottery Authority (NLA) is seeking to modernize the operations and management of the Lottery Industry through the replacement of the wooden kiosks and the metal containers with modernized solar-powered e-kiosks. 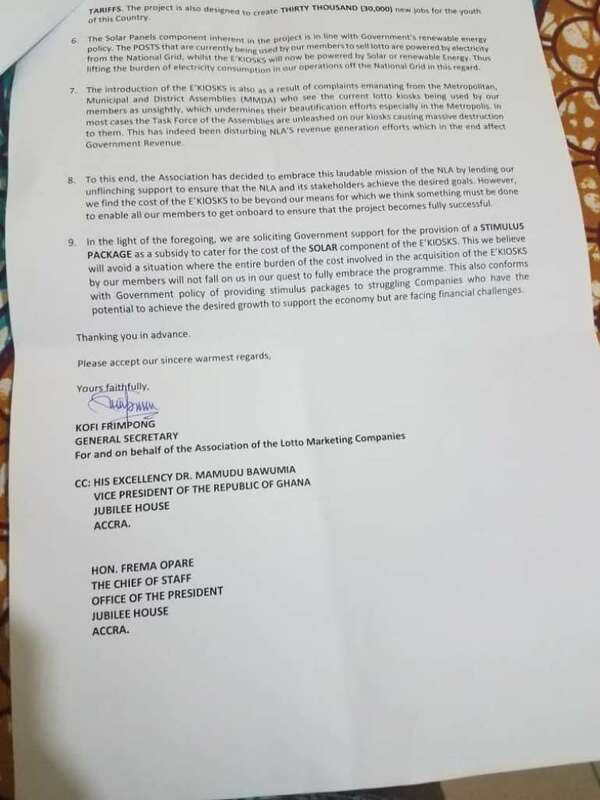 The group petitioned President Akufo-Addo, Vice-President Mahamudu Bawumia, the Ministry of Finance, the Board Chairman and Director-General of the National Lottery Authority (NLA) to support them with a stimulus package to enable them acquire the solar-powered vending facilities. In light of the foregoing, we are soliciting the government’s support for the provision of a stimulus package as a subsidy to cater for the cost of the solar component of the e-kiosks. 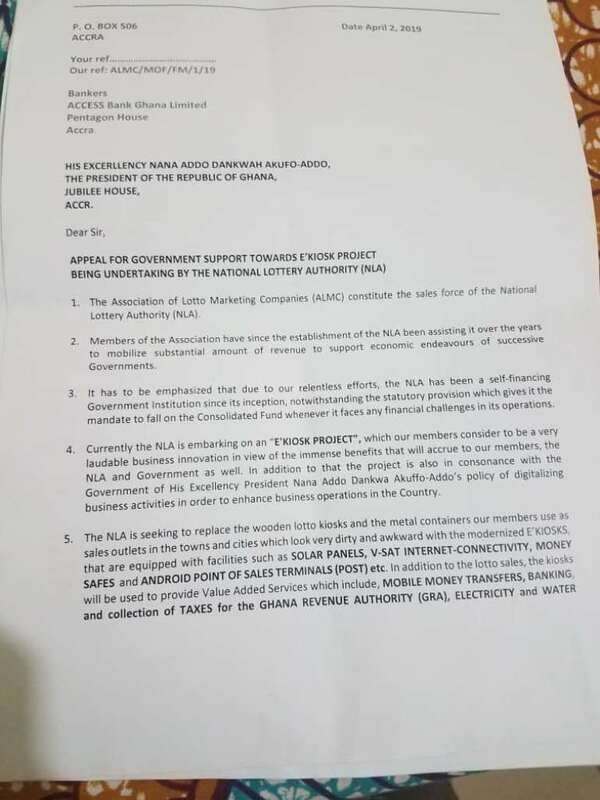 This we believe will avoid a situation where the entire burden of the cost involved in the acquisition of the e-kiosks by our members will fall on us in our quest to fully embrace the programme [by the NLA]. 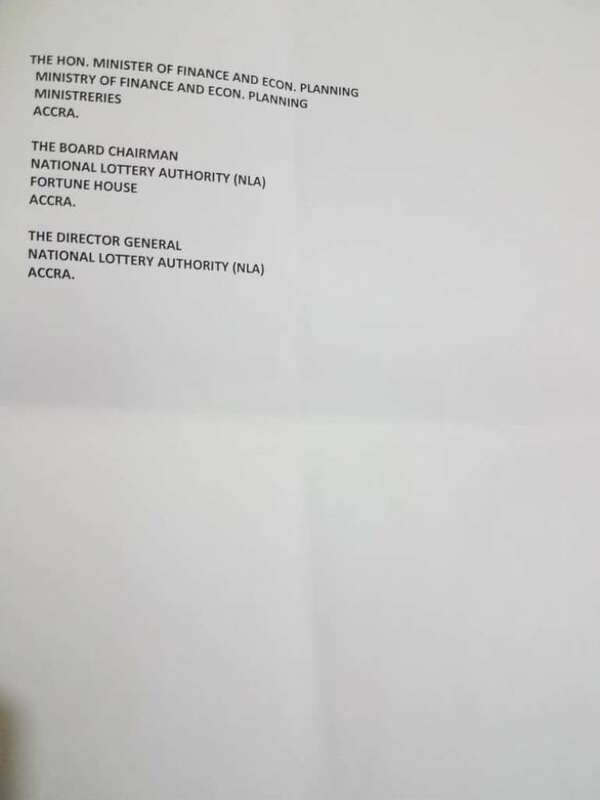 This also conforms with government’s policy of providing stimulus packages to struggling companies who have the potential to achieve the desired growth to support the economy but are facing financial challenges,” excerpts of the petition signed by the General Secretary of the Association of Lotto Marketing Companies, Mr. Kofi Frimpong read. The National Lottery Authority (NLA) is seeking to modernize the operations and management of the lottery industry through the replacement of the wooden lotto kiosks and the metal containers with modernized solar-powered e-kiosks. The NLA had said the wooden lotto kiosks and metal containers are not business friendly, and unable to reduce lottery stigmatization, thereby reducing sales and revenue generation. In addition to the sales of lotto, the solar-powered E-kiosks is aimed at providing value added services such as Mobile Money Interoperability transactions, Banking, Remittances and collection of taxes for the Ghana Revenue Authority, payments of Electricity and Water Tariffs. The e-kiosk project is designed to create over Thirty Thousand (30,000) new jobs for the youth of this country. The e-kiosk project is also in consonance with Government’s Policy of digitalizing the Economy. 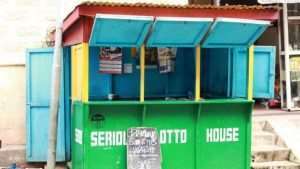 The leaders of the Association of Lotto Marketing Companies say they have received several petitions from their members over constant harassment and demolitions of their wooden lotto kiosks and metal containers by the Metropolitan, Municipal and District Assemblies.